As the Sochi Olympics come to a close, we reflect on the many lessons emanating from the international athletic competition. From the spectacular Opening Ceremonies through the triumphs of winning Gold Medals through the stories of individuals proudly representing their country, to the athletes rescuing stray dogs, to the heartbreak of USA Hockey Teams through the extinguishing of the Olympic flame – passion, competition, challenge and triumph abound. Plans & Goals: For all of the Olympic athletes, they had a goal to become an Olympic athlete and a specific plan on how to achieve that goal. To be a successful agent, you must have a specific annual goal (and 5 year and 10 year goal) as well as a detailed business plan describing how you are going to reach that goal. Commitment, Dedication & Discipline: The Olympic Games occur every four years. If you want to be an Olympic Athlete, there are many interim competitions in which you must perform and win to achieve your 4 year goal. How would you compare your level of commitment, dedication and discipline to YOUR chosen “sport” of real estate? Are you singularly focused on winning the game of real estate? Tenacity, resilience and dedication are as vital to business as they are to sport. Energy, Passion & Enthusiasm: Undoubtedly, Olympic athletes are passionate about being an athlete. Would your level of conviction towards selling real estate match that of Gracie Gold for skating or Shaun White for snow boarding? Be excited to help others with their real estate needs (and make a good living by doing so!) Approach your career with the type of energy and commitment and be such an ambassador that retailers will be seeking you out for endorsement deals! Community & Team: Whether you are an independent agent or on a Team, ALL agents are part of a team. All agents have a broker, an affiliated lender, closing attorney, inspector, colleagues, branch manager, etc. You should never feel alone in your endeavors. At Maximum One, you have various “communities” within which to network and work… your branch, your company, your Board, etc.. Additionally, by being a real estate agent, you are part of a community. If you perceive your colleagues in other brokerages as part of the larger community within which you work, you may approach your transactions a bit differently. During the Opening Ceremonies, all the athletes walked in with their country and all of the athletes from all countries together considered one class – Winter Olympics 2014! Excellence in Performance: In the end, it all comes down to one ultimate goal – excellence in performance. With all the business planning, goal setting, role playing, marketing and strategizing, you still have to perform when it counts! It takes work, focus under pressure and never settling. Be competitive, celebrate your successes and continue to improve! When you are meeting a new client for the first time (& throughout your professional interaction with them) you are performing! Do you present yourself like you are performing at the Olympics? Appropriate attire, proper spelling and grammar in written communication, have answers to their questions or know where to get the answers? Think of yourself as an elite performer in your chosen field! Olympic athletes demonstrate excellence to which to aspire. Put a few of their disciplines into practice to give yourself and your business a good chance of delivering an Olympic gold medal winning performance. If you need another dose of Olympic excitement, the Summer Olympics will be here in 2016 in Rio de Janeiro, Brazil! 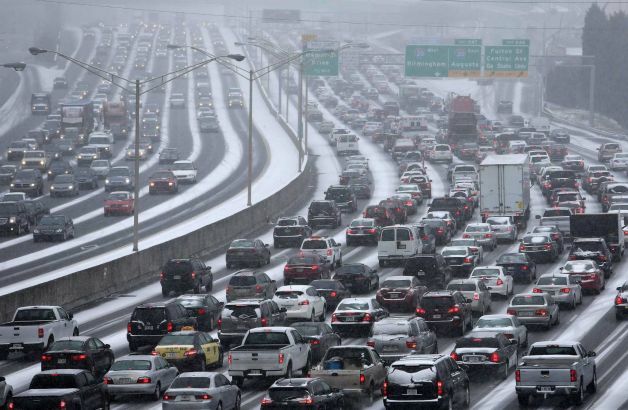 The Great Atlanta Snow Storm of 2014 will not soon be forgotten! Now that all are home safely, what lessons may we glean for our real estate business? Many got caught unprepared by the timing and severity of the storm that hit Atlanta this week. It took some hours to get home, some never made it home, cars were abandoned in the middle of the road and school children were stranded at schools or worse on school buses. During the “heat of the moment,” thoughts and actions were singularly focused on safety, warmth and basic necessities. Now that the crisis has passed, we pause to reflect on the good, the bad, whom to “blame” and how to prevent being caught unaware in the future. This snow storm represents potentially every real estate transaction you enter! Take this week’s weather as a guide to become a better real estate professional! Research the Situation: What are the comps of an area, what is the reputation of the schools in a neighborhood your clients pursue, what is the best way to get new business, etc. Do you have a “niche” market? Do you have more than one niche? Do you market by phone, email, internet, mail or combinations thereof? Where are your Sellers moving to and what is their time frame? What if your Buyer’s closing gets delayed? Tried and true methods of practicing real estate create the foundation of your business, but always seek new neighborhoods, methods, price ranges, etc! Last Tuesday, did you only check out one weather report or did you research several? Do you know more than one way to get home? Accept the Kindness of Others: We all heard many negative stories of stranded motorists and we also heard a myriad of heartwarming acts of kindness by total strangers! People at stop signs helping cars get up a hill, stores opening their locked doors for people to use restrooms, grocery stores giving free food to school buses full of children! you are not alone in your real estate business! Reach out to others for assistance! Lenders, colleagues, attorneys, brokers and co-op agents will likely assist you when asked! In any one real estate transaction, all parties on “both sides” of the deal are working towards the same end result… transferring ownership of the property! Don’t Try to Place Blame: The “Blame Game” is now beginning in Atlanta! The Governor should have done more! GEMA should have acted sooner! The schools should have cancelled schools or released the children earlier! The Mayor should have sent out the sand/snow trucks sooner! The weatherman should have been more accurate! After the damage has been done, finding who is to blame is a futile effort. After an unexpected issue / situation has occurred, look for solutions rather than fault! We cannot change the past so how may we address the issue now to move forward? Can we get the appraisal reviewed, can we find another lender with different underwriting criteria? Will the Seller purchase a home warranty to cover a hot water heater that could not be tested? Can we extend the Due Diligence time frame until the house is de-winterized? “Sorry won’t change circumstances.” Again, all parties are working towards the same end result so let’s look for workable solutions! You won’t soon forget a disaster of a transaction, but you will take lessons from that deal to make you a better agent for future clients!